The mechanisms of nanoscale fatigue of functionally graded TiN/TiNi films have been studied using multiple-loading cycle nanoindentation and nano-impact tests. The functionally graded films were sputter deposited onto silicon substrates, in which the TiNi film provides pseudo-elasticity and shape memory behaviour, while a top TiN surface layer provides tribological and anti-corrosion properties. Nanomechanical tests were performed to investigate the localised film performance and failure modes of the functionally graded film using both Berkovich and conical indenters with loads between 100 μN and 500 mN. The loading history was critical to define film failure modes (i.e. backward depth deviation) and the pseudo-elastic/shape memory effect of the functionally graded layer. The results were sensitive to the applied load, loading mode (e.g. semi-static, dynamic) and probe geometry. Based on indentation force–depth profiles, depth–time data and post-test surface observations of films, it was concluded that the shape of the indenter is critical to induce localised indentation stress and film failure, and generation of pseudo-elasticity at a lower load range. Finite-element simulation of the elastic loading process indicated that the location of subsurface maximum stress near the interface influences the backward depth deviation type of film failure. Studies on designing polymeric fibres based helical auxetic yarn (HAY) to maximise their auxetic effect are yet to propose optimised design configurations for general impact mitigation applications. This study therefore presents optimal design parameters through analytical calculations and finite element (FE) method. Three main design parameters were considered which includes Poisson’s ratio, core/wrap diameter ratio, and starting wrap angle. The Poisson’s ratio of the HAY was calculated by measuring its total diameter at a given rate of strain. The investigation found here to be a starting wrap angle of a HAY (critical angle) that resulted in the highest possible exhibiting of the auxetic effect. The critical angle was determined to be 7°, and a maximum NPR of −12.04 was achieved with this design. 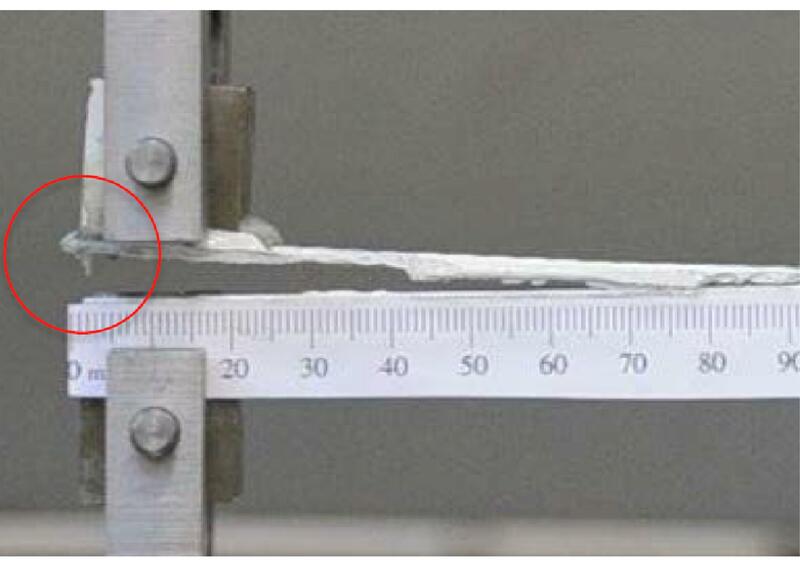 Failure behaviour of two types of adhesively bonded joints (composite-to-metal, metal-to-metal) has been studied under failure modes (Mode I: double cantilever beam (DCB) and Mode II: three-point end notch flexures (3-ENF)) using acoustic emission (AE) technique. The bonded specimens were prepared using two types of adhesive bond materials with three variations of adhesive bond quality. The effect of the presence of interfacial defects along the interface on the residual strength of the joint has also been studied. It was possible using the maximum AE amplitude method to select the AE events of mechanical significance. However, it proved difficult to propose a definitive AE trait for the mechanical phenomena occurring within specific AE event signals, for all adhesive types, bond qualities, and substrate configurations; therefore, all specimen combinations. There was a notable shift in spectral energy proportion as the AE source of mechanical significance varied along the specimen length for specimen combinations. However, it was difficult to confirm this distinctive trait for all specimen combinations due to difficulty in confirming the location and exact mechanical source. The proposed measurement technique can be useful to assess the overall structural health of a bonded system and may allow identification of defects. This study presents an improved approach to the quality assessment of thermally sprayed coatings. Measurements were carried out on five different coatings. Since it is the overall extent of surface cracking during Vickers indentation that is indicative of the volumetric damage, the surface crack length was measured, including the radial cracks, edge cracks, and other cracks around the indentation. 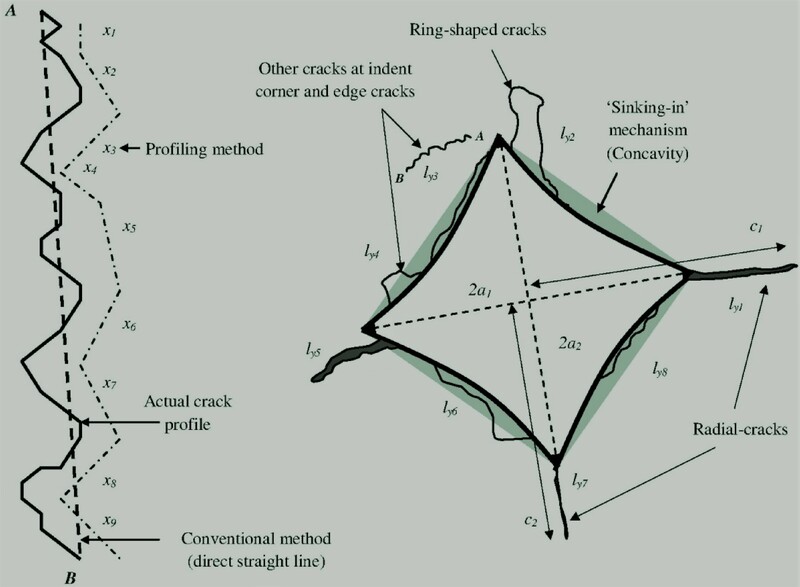 It is concluded that the proposed model provides a way forward for determining the fracture toughness (K1c) of brittle materials where no radial cracks are developed. 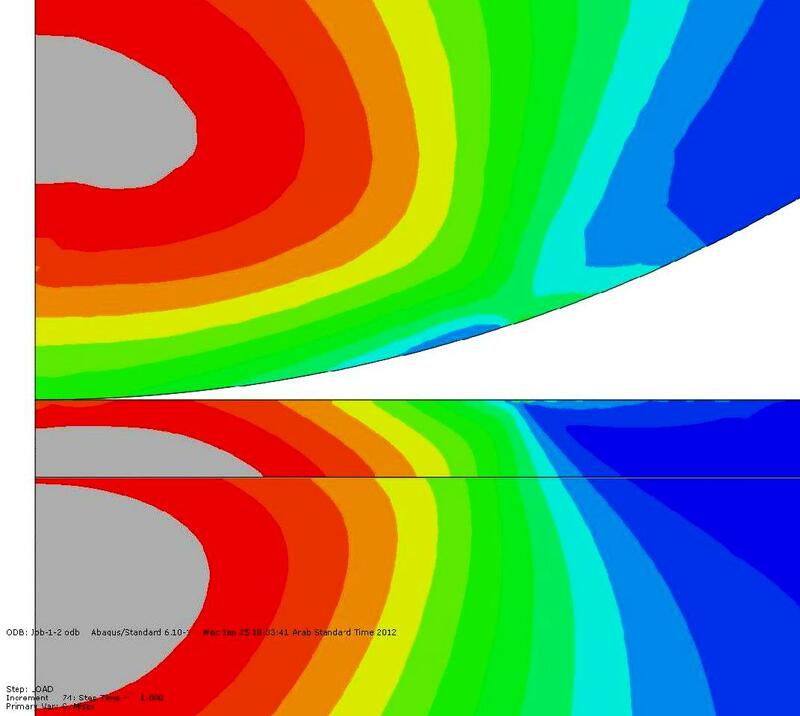 An elastic–plastic finite element simulation of the Vickers indentation test was conducted to locate the stress fields. 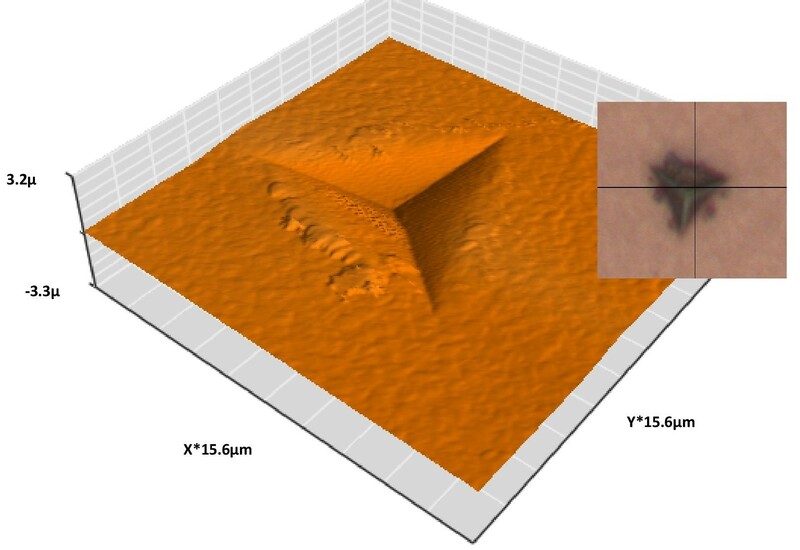 The aim of this paper is to investigate the mechanism of nanoscale fatigue using nano-impact and multiple-loading cycle nanoindentation tests, and compare it to previously reported findings of nanoscale fatigue using integrated stiffness and depth sensing approach. Two different film loading mechanisms, loading history and indenter shapes are compared to comprehend the influence of test methodology on the nanoscale fatigue failure mechanisms of a DLC film. An amorphous 100 nm thick DLC film was deposited on a 500 μm silicon substrate using sputtering of graphite target in pure argon atmosphere. Nano-impact and multiple-load cycle indentations were performed in the load range of 100 μN to 1000 μN and 0.1 mN to 100 mN, respectively. Both test types were conducted using conical and Berkovich indenters. Results indicate that for the case of a conical indenter, the combination of nano-impact and multiple-loading cycle nanoindentation tests provides information on the life and failure mechanism of the DLC film, which is comparable to the previously reported findings using the integrated stiffness and depth sensing approach. However, the comparison of results is sensitive to the applied load, loading mechanism, test-type and probe geometry. The loading mechanism and load history are therefore critical which also lead to two different definitions of film failure. The choice of exact test methodology, load and probe geometry should therefore be dictated by the in-service tribological conditions, and where necessary both test methodologies can be used to provide better insights of failure mechanism. Molecular dynamics (MD) simulations of the elastic response of nanoindentation are reported, which indicate that the elastic modulus of the film measured using MD simulation was higher than that experimentally measured. This difference is attributed to the factors related to the presence of material defects, crystal structure, residual stress, indenter geometry and loading/unloading rate differences between the MD and experimental results. During thermal spraying, hot particles impact on a colder substrate. 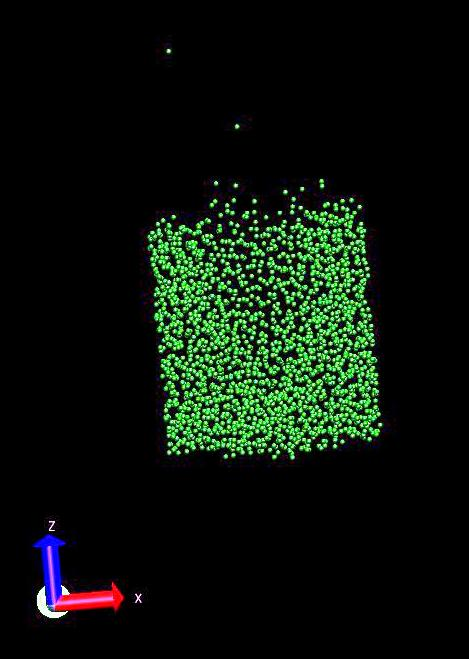 This interaction of crystalline copper nanoparticles and copper substrate is modeled, using MD simulation. The quantitative results of the impacts at different velocities and temperatures are evaluated using a newly defined flattening aspect ratio. This ratio between the maximum diameter after the impact and the height of the splat increases with increasing Reynolds numbers until a critical value is reached. At higher Reynolds numbers the flattening aspect ratio decreases again, as the kinetic energy of the particle leads to increasing substrate temperature and, therefore, decreases the substrate resistance. Thus, the particle penetrates into the substrate and deforms less. This work presents an enhanced instrumented Vickers indentation technique capable of recording force, displacement and acoustic emission (AE) during loading condition. Four materials were chosen for examination; copper, aluminium, steel and as-sprayed HVOF WC-12%Co coating. Results indicate that force–displacement (P–h) profiles are essentially bilinear with two characteristic slopes separated by a distinct displacement arrest for all loads above 98 N. The P–h curve indicates three distinct loading stages (I, II and III) and the stage III mechanical energy increases with loads. About 66% of the hardened steel indentations but only about 18% of the as-sprayed HVOF WC-12%Co coating indentations exhibited an AE record that could be separated into three distinct zones (A, B and C). Where zoning was possible the AE corresponding to a zone correlated well with the AE associated with a loading stage. It is concluded that plastic deformation in soft metals produced little AE, whereas brittle fracture in hardened steel and as-sprayed HVOF WC-12%Co coating produced significant AE. AE may or may not be focused onto particular stages of the indentation and a full measure of crack prevalence would require fractal dimension analysis, which is time consuming, offering a motivation for AE-based indentation testing. 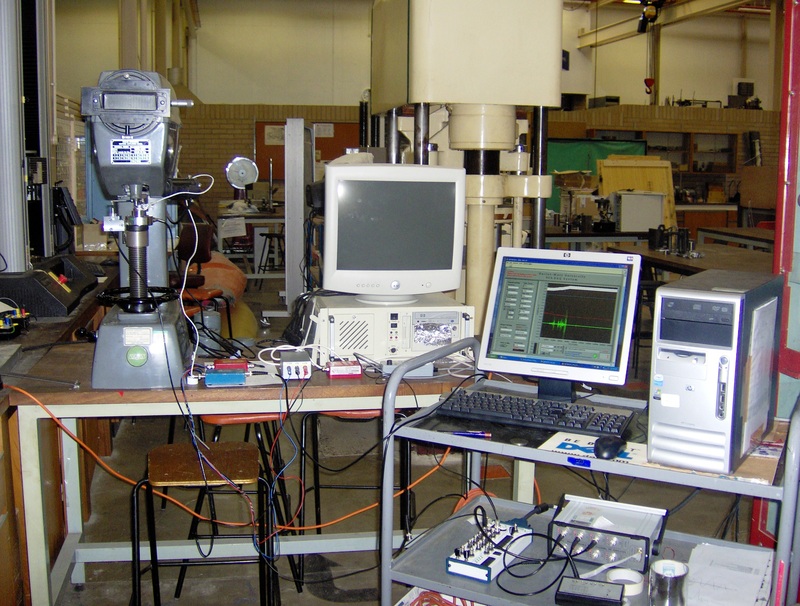 This work presents an in situ monitoring of HVOF thermal spraying process through an acoustic emission (AE) technique in an industrial coating chamber. Single layer thermal spraying on substrate was carried out through slits. 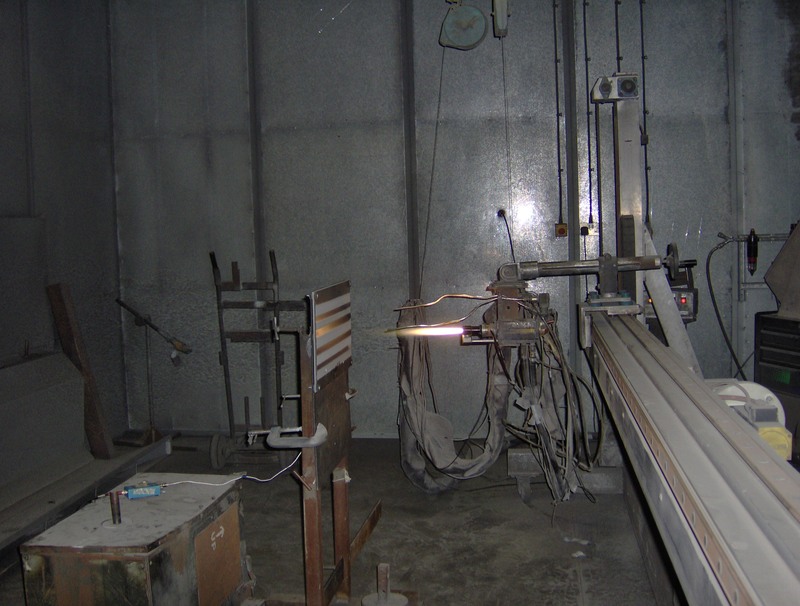 Continuous multilayer thermal spraying onto the sample without slit was also conducted. The AE was measured using a broadband piezoelectric AE sensor positioned on the back of the substrate. A mathematical model has been developed to determine the total kinetic energy of particles impacting the substrate through slits. 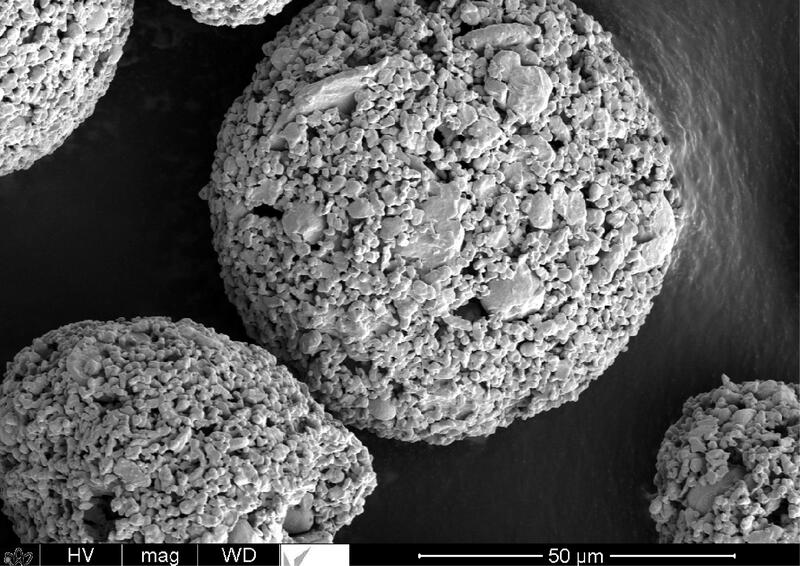 Results of this work demonstrate that AE associated with particle impacts can be used for in situ monitoring of coating process. Results also show that the amplitude and AE energy is related to the spray gun transverse speed and the oxy-fuel pressure. The measured AE energy was found to vary with the number of particles impacting the substrate, determined using the mathematical model. The failure of an orthopaedic implant can be initiated by residual strain inherent to the hydroxyapatite coating (HAC). Knowledge of the through-thickness residual strain profile in the thermally sprayed hydroxyapatite coating/substrate system is therefore important in the development of a new generation of orthopaedic implants. As the coating microstructure is complex, non-destructive characterization of residual strain, e.g. 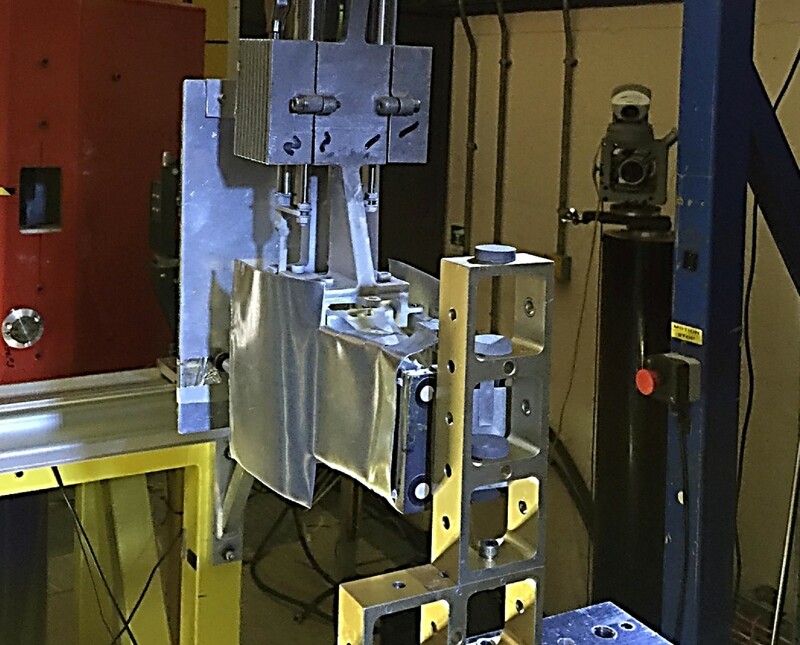 using neutron diffraction, provides a useful measure of through thickness strain profile without altering the stress field. This first detailed study using a neutron diffraction technique, non-destructively evaluates the through thickness strain measurement in nanostructured hydroxyapatite plasma sprayed coatings on a titanium alloy substrate (as-sprayed, heat treated, and heat treated then soaked in simulated body fluid (SBF)). The influence of crystallographic plane orientation on the residual strain measurement is shown to indicate texturing in the coating. This texturing is expected to influence both the biological and fracture response of HA coatings. Results are discussed in terms of the influence of heat-treatment and SBF on the residual stress profile for these biomedical coatings. The results show that the through thickness residual strain in all three coatings was different for different crystallographic planes but was on average tensile. It is also concluded that the heat-treatment and simulated body fluid exposure had a significant effect on the residual strain profile in the top layers of HAC.